The scientists say the majority of ravens in the study area were now living on transmission poles and posed a bigger threat to endangered species. Raven numbers in western states have increased by more than 300% in the past 40 years, say the researchers. Long known for their intelligence, ravens have shown great abilities to adapt and take advantage of human engineering. Other species including ospreys, eagles and hawks have all shown a tendency to perch or nest on electricity transmission lines, but this new study suggests that few others have tended to colonise power poles in such numbers. The study looked at a sage brush ecosystems in south-eastern Idaho, where power lines and roads have been developed over the past 20 years. Raven numbers in the area increased 11-fold between 1985 and 2009, say the authors, and 58% of nests were now located on transmission poles. "They are coming back to the nest sites on power poles year after year," said co-author Kristy Howe from Idaho State University. "They may be influencing other ravens and their own young - they were born on a power pole and they think that's where they should be nesting." Located high above the sage brush, the nests provide the ravens with a wider range of vision, higher attack speed and easier take-off. They are using the height advantage to target the nests of the greater sage grouse, an endangered species. There has long been speculation that grouse numbers were threatened by coyotes or badgers, but researchers now know that the ravens are a real threat as well. "The ravens can't really take out an adult sage grouse, but if they can identify a nest they can go in and bump that hen off her nest and systematically take her eggs," said Kristy Howe. The ravens also prey on other endangered species including the San Clemente loggerhead shrike and the desert tortoise. But deciding to make their homes on electric cables does come with risks. 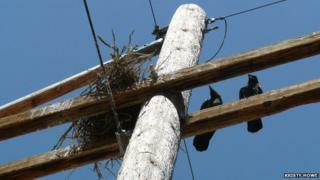 "Power lines are dangerous and electrocute many species of birds, the ravens are running that same risk as well. Maybe they are smart enough to know not to touch a particular line? The benefits to them outweigh the risks," said Kristy Howe. The big concern for researchers is the continued expansion of ravens which are taking advantage of the renewal and development of electricity transmission infrastructure in western US states. This is a particular worry in areas of contiguous habitat such as sagebrush steppe, said Kristy Howe. "We are likely to see a raven infiltration into those areas that power lines have never run through before and that is the real risk to sage grouse," she explained.